Keep your entryway tidy with this solid wood Amish Mission Small Backless Storage Bench. 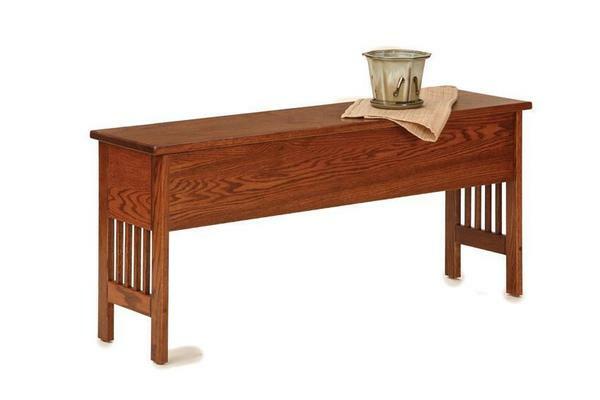 You'll look forwarding to going home and getting ready to relax using this storage bench. Use the Amish bench to sit and remove your shoes and tuck them neatly underneath. You'll love the ample storage this bench offers, allowing you to store winter accessories during the colder months. Keep bulky items like coats out of the way with the help of solid wood Amish furniture. The bench storage area is also a great spot to keep games, sporting/dance bags, toys...the possibilities are truly endless! The Mission Bench has a soft close feature and stay-open lid to protect fingers. Be sure to take a look at our blog, Timber to Table, to learn more about the many uses of storage benches. Please feel free to get in touch with us by calling 866-272-6773. We'd love to answer any questions that you may have. Width (from Front to Back): 8 1/2"
Depth (from Top to Bottom): 6"
Clock surprisingly arrived nearly 2 months early!